E-ink-Reader. Overview of dictionary for e-book readers. Often, when we read we can see unfamiliar words , the translation of which we would like to understand . 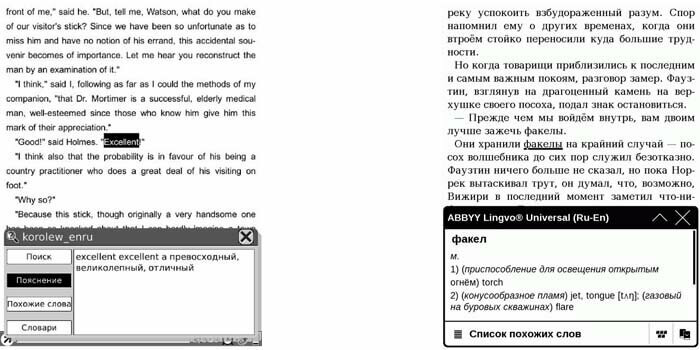 Many modern ebooks have the function of a dictionary that allows you to select the word you need and quickly find its meaning (translation) . The photo shows the dictionary Onyx Boox i62M and Pocketbook Touch 622 looks like. Not all models of electronic books have supporting of dictionaries. Dictionaries for each reader to look different. In some models, you have simply to double-tap the word, which translation or interpretation you need, in other to get to the dictionary , you need to execute some commands on the menu. Different dictionaries can be originally installed in the device , or can be downloaded as an additional application. Built-in e-book dictionaries can't be replaced , they can only be turned off. Dictionaries installed separately are convenient because you can choose the most suitable variant for the user or use several dictionaries together. You can create dictionaries your own in some formats . Below is a summary table of e-books, revealing the possibility of using them in different vocabularies. Expl. Eng. Expl. Fra. Expl. Ger. Expl. Rus. Eng. ▼ Rus. Fra. ▼ Rus. Ger. ▼ Rus. Expl. Eng. Expl. Fra. Expl. Ger. Expl. Rus. Eng. ▼ Rus. Fra. ▼ Rus. Ger. ▼ Rus. - It is, after firmware change to an alternative. - еIs, under some icons hidden links to downloads dictionaries. for Pocketbook - in offical site . ³ - You can convert your own, StarDict format.